Observations – Nature ~ IQ: Let's Survive, Not Die ! My poem Do You Believe ~, which will be a part of the 2nd book in the Nature ~ IQ: Let’s Survive, Not Die! series is also among the many poems in the World Healing, World Peace Poetry 2014 Anthology as featured at The Hamilton Gallery ~ Online.com. This vision of world healing and peace, if such a hope is going to come to fruition, it will take much struggle through effort within the human thinking process. Humanity collectively within the process of reflective consciousness will firstly have to change the way we perceive ourselves. We the people of the planet earth will have to accept that our kind, our species is nothing more than simply human. We must accept ourselves, not necessarily forgive and forget the lessons taught during the human experience; however, humanity should no longer bear the weight of quilt or feel remorse for living our lives the best we can regardless of the mistakes we’ve made as individuals or as a whole. We must come to understand that no one gave us an all-encompassing guidebook on how to live and survive, how to bring about a healthy, joyful, prosperous and peaceful world. We must realize it is a waste of time and energy to cast blame or point a finger in an attempt to somehow rectify past transgressions against each other and other living creatures. If such a vision of world healing and then peace is to transpire, We the people will have to become perceptually more positive towards our kind. We’ll have to become more pro-human minded. If we want the intolerant to become more tolerant, we must lead the way by patiently demonstrating the behavior of tolerance towards them as they undergo the process of transformation. If this transformation is going to happen we must take the lead by proactively exhibiting a pro-human mindset, not only through words, but through actions as well. Only then will our united vision for world healing to bring about peace make substantial headway along its transitional journey. To make progressive headway, We the people need to see the wisdom and then initiate the forming of a cooperative partnership with our servant(s) the government(s). Such a partnership will provide the necessary foundation and means to come up with flexible and transitional concepts that lead to valuable practices, implemented with the assistance of innovative technologies for the purpose of improving the overall wellbeing of humanity. In the first eBook of the online series Nature ~ IQ: Let’s Survive, Not Die! (soon to be published in print by Inner Child Press), I suggested for these concepts and practices to be of benefit to humanity, they need to be centered ideologically around 5 freely accessible and affordable services: energy, information/education, transportation, health care and housing. Freely accessible and affordable services such as these will uplift the spirit of humanity making us all overtime more positive and productive contributors and less of a burden on society. Not only blessing us with the ability to help ourselves, but giving us the time and resources to help others. In turn as we help others, they will help others help themselves, on and on through a reciprocal process of healing. Where this process of healing keeps building in momentum and transitioning until the transformation of We the people becomes healthy, joyful and prosperous. Ultimately creating an environment of wellbeing that’s void of the trials and tribulations which held the world captive to anger, hatred, strive, illness and pain. At such a time, the wind then will howl no more due to the storm; ‘cause the wind will be saturated with the sweet music of peace. ~Keith Alan Hamilton~ is an independent online publisher, editor, poet/writer & Smartphone photographer. Keith has 3 Blogs: Keith Alan Hamilton.com, http://www.keithalanhamilton.com/blog, NatureIQ.com, http://www.natureiq.com, and The Hamilton Gallery ~ Online.com, http://www.thehamiltongalleryonline.com. 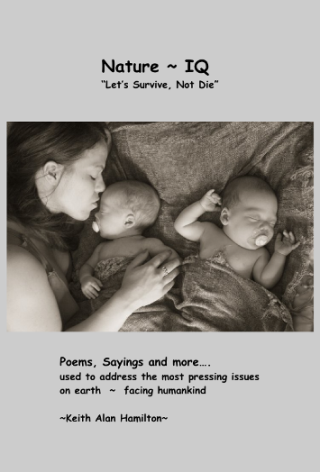 Keith’s first eBook in the series Nature ~ IQ: Let’s Survive, Not Die! is available online to read free of charge. http://www.natureiq.com/download/NatureIQ%20ebook1.pdf. It will be published in print by Inner Child Press soon. On the TV show 60 Minutes was a segment on Khan Academy. What a huge step forward in providing We the people of the planet earth freely accessible and affordable information/education as suggested in my book Nature ~ IQ: Let’s Survive, Not Die! This photo should be on the cover of Rolling Stone. If you are pro-humanity, read for Free (Computer & Smartphone) the PDF version of my ebook Nature ~ IQ: Let’s Survive, Not Die! -save it, print it out, email it, copy it and distribute it widely to all you can. “Run, walk, crawl or with the help of others, I will start then finish the Boston Marathon next year in 2014. At present, I am around 6’ 1” tall, overweight at 280 lbs and I’m in the worst shape of my life, but I promise I will be standing at the starting line in Hopkinton, Mass in April 2014. My effort to get ready for this event and then finish it will be representative of the struggle for life, like the Boston Marathon, where those running it must push forward, keep going, adapt to and overcome adversity to finish the race while encouraged to do so by those along the way. My struggle, along with my fellow participants and those that give support along the route from beginning to end will once again exemplify Boston Strong! How the united will of – We the People, those of Boston, New England, the United States of America and fellow humans of the world, shall overcome the struggles of life, which include acts of terror. No matter if such warmongering acts of terror are perpetrated by extremists or nature itself through drastically disruptive earth change. Most of all, I hope each of my steps starting hence forth, whether during preparation for the race or during the Boston Marathon will bring eternal honor and everlasting remembrance to all those who were murdered or horrifically injured during this year’s Boston Marathon. I hope it brings praise to the heroic valor, the selfless acts of all those who helped the victims and participated in bringing the perpetrators to justice without hesitation or fear. It will help the families, the friends of the victims, We the people of the United States of America and the people throughout the world to heal and find the strength to keep living together in peace while collectively facing adversity. I also run this race in tribute to my father Jim, who fought the good fight against lung cancer until passing away in August 2012. In my late twenties my father and I used to run road races together and we talked of someday running the Boston Marathon. Then there is my childhood friend Jim, who is courageously and gallantly living the good fight against cancer. His example has inspired me so…. and he knows he is loved by family and friends. I also run for another of my childhood friends Donny, who has defiantly spit in the face of illness while as a police officer protecting his community. His spirit and humanity is infectious and all that know him are fortunate to have him in our lives. My son Jason, who despite the obstacles forced on him at birth, has made his father proud through his strength and determination to live life each day. He is his father’s teacher and hero. We the people of the earth…. let’s shed the guilt and the blame for simply being human…. let’s improve our Nature ~ IO – Let’s Survive, Not Die! Note: My dear friend Jimmy has recently passed away and I miss him dearly. This blog will not only pertain to what was written in the 1st book of the Nature ~ IQ: Let’s Survive, Not die!, book series, but it will also be the communication point of putting forth the 2nd book and it’s connection to me running the Boston Marathon in 2014. Stay tuned…..